One of my favorite things to do in my down time is embroidery. I seem to have a hard time just hanging out and watching a movie – without working on some sort of project at the same time. That is especially true in the summer! 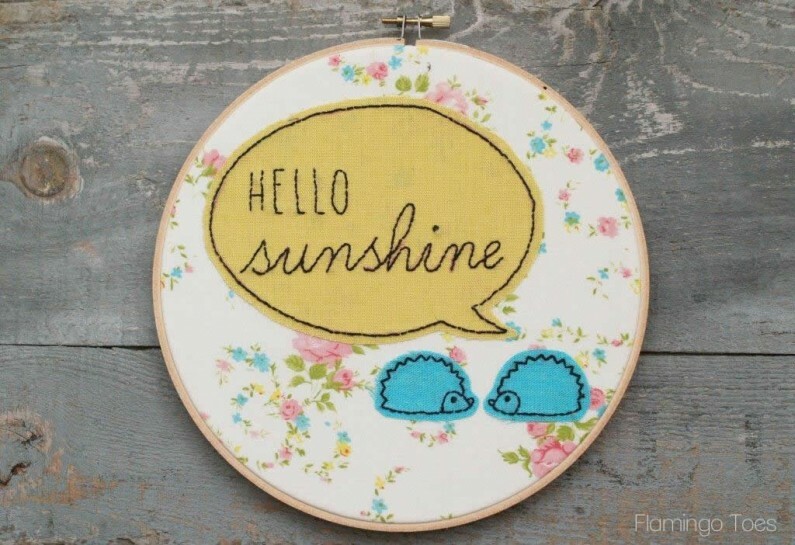 Embroidery projects are so perfect for taking along on road trips, or to do while hanging out at the pool with the kids. So today I have a fun little stitching project for you ! It’s perfect for summer, or really any time of year! 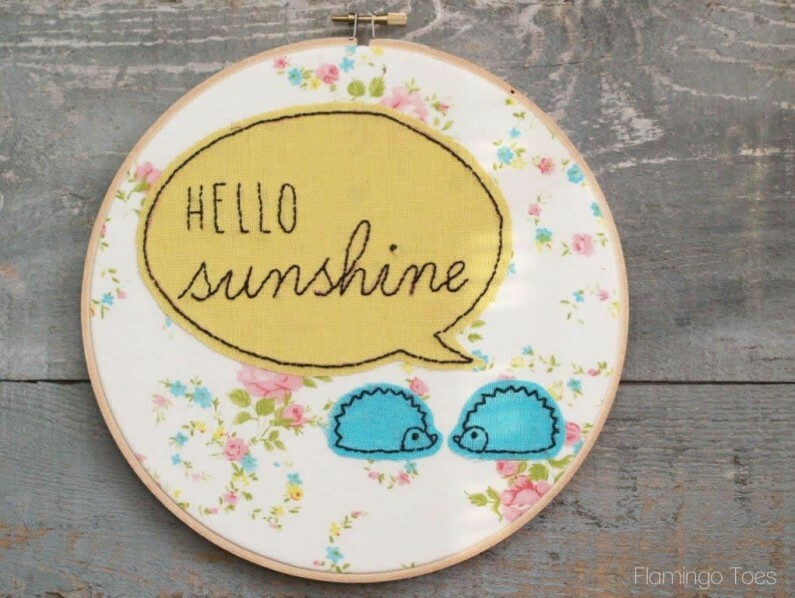 It’s my little Hello Sunshine Embroidery Hoop Art. It’s a sweet little design embroidered on linen, then fused onto a vintage sheet. You could use any fabric/prints though – it’s perfect for stashbusting too! It’s a very basic embroidery stitch too – so it’s a great beginner project. 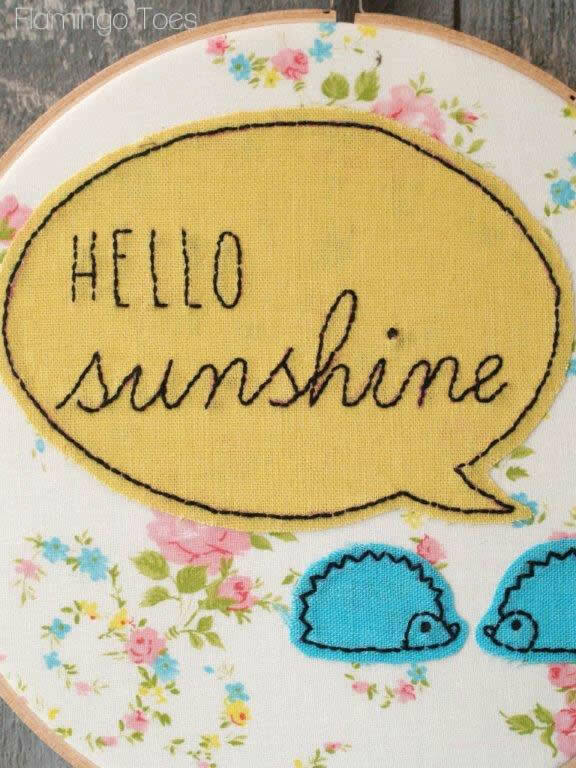 And it has hedgehogs – which are always adorable. So are you ready for a quickie tutorial? 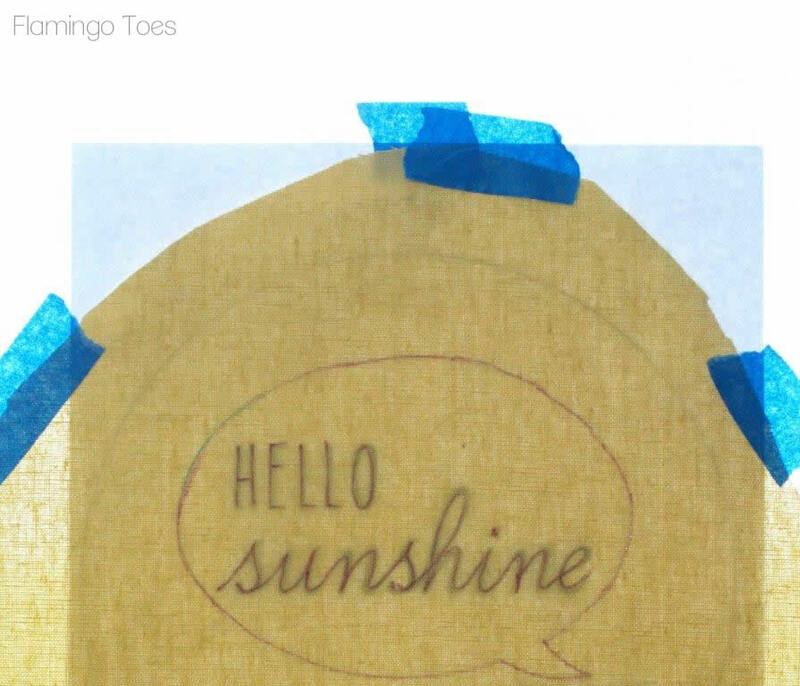 Start by tracing just the word bubble and lettering on a piece of fabric. I usually tape my pattern up in a window, then tape my fabric over it. Boom. Instant light box. Use a disappearing marker to trace the design. 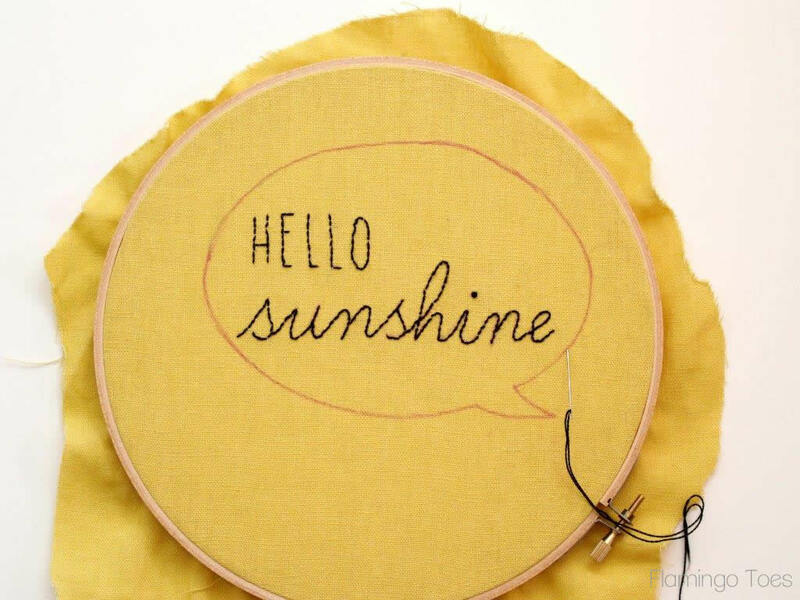 Once your design is traced, pop your fabric in your embroidery hoop and begin stitching. I used a back stitch for the entire project. 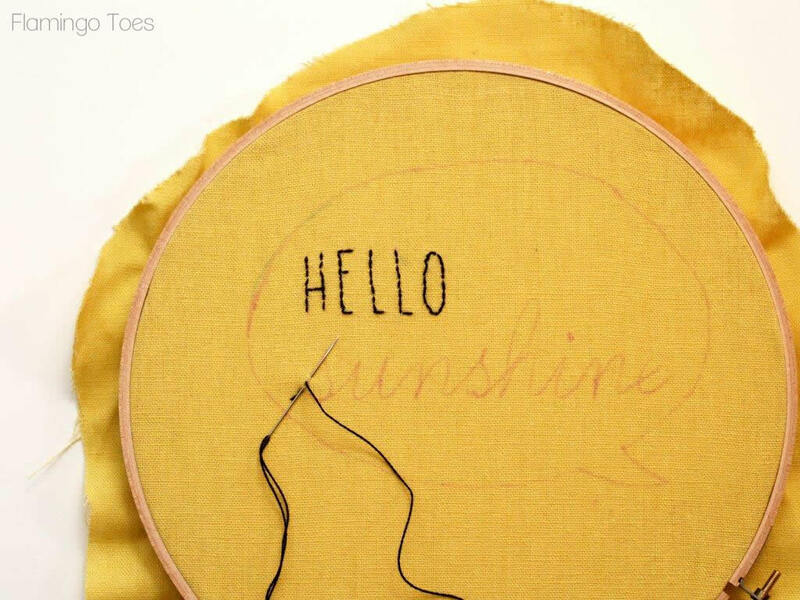 If you need help with that stitch, you can check out my How To Do That: Embroidery Page. It has super easy mini-tutorials for basic embroidery stitches. 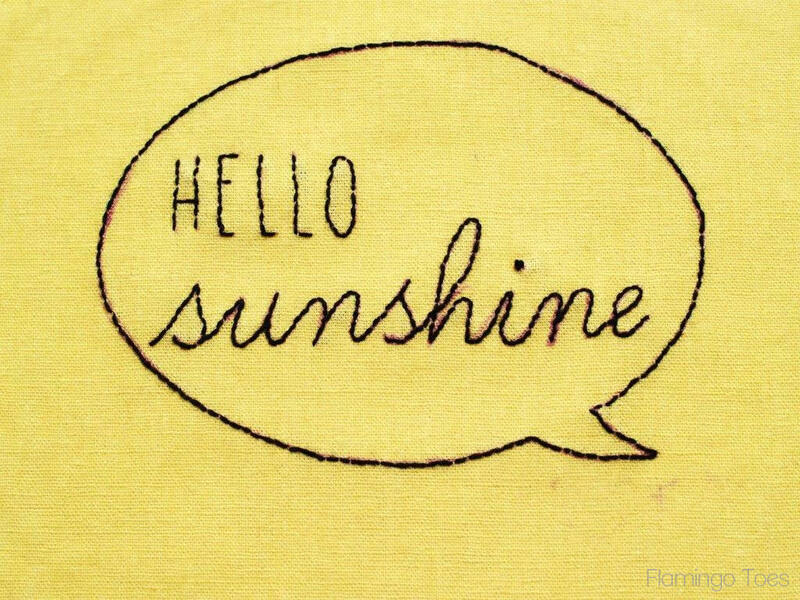 I started with the “Hello”, then moved to “sunshine”. Then finish off by outlining the bubble. 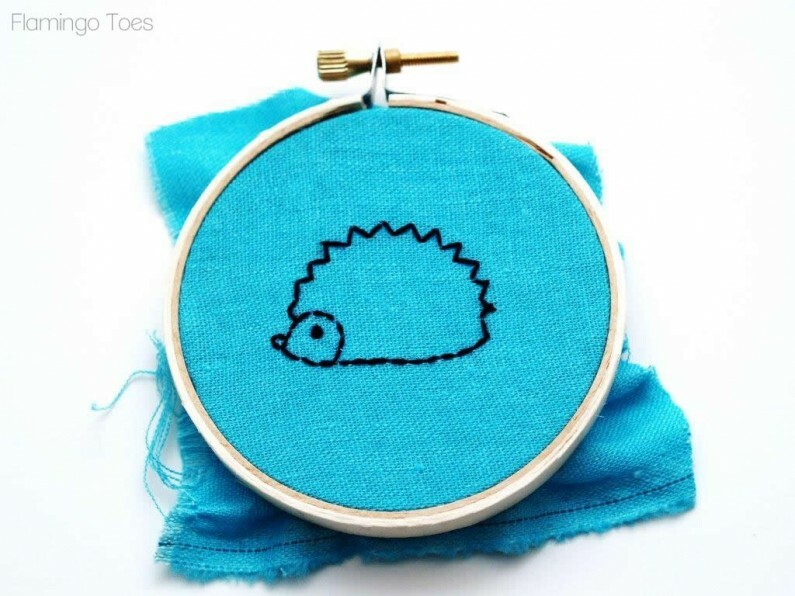 Repeat your process for the little hedgies. 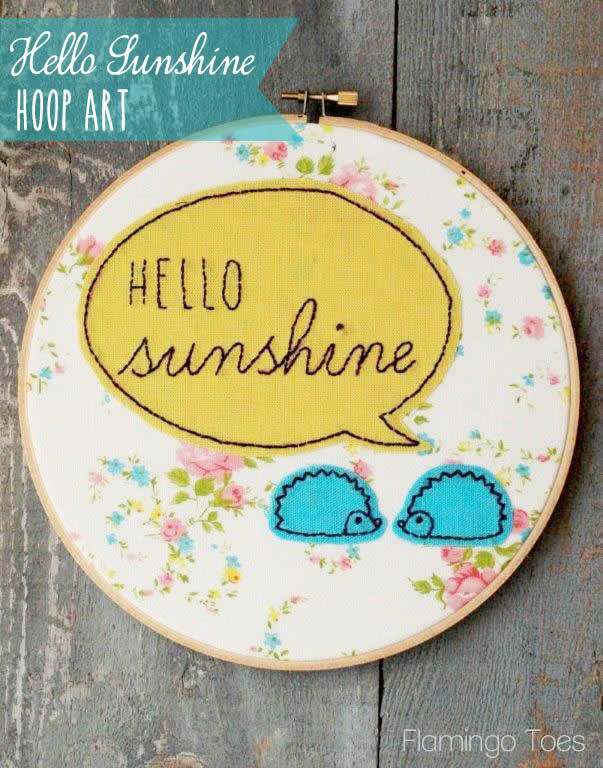 Iron away, then put your fabric into your hoop. Trim the extra fabric off and glue the edges to the inside of the back of the hoop. You can finish off the inside with some trim or just cover the whole back with a piece of felt. And that’s it! Wouldn’t that be fun to stitch up on your next road trip? Are you a traveling crafter? What do you like to craft on the road? Linking up at Sunday Scoop, Today’s Creative Blog, Met Monday, Tutorials & Tips Tuesday, Quilt Story, Shabby Creek Cottage, My Repurposed Life, 504 Main, Everything Etsy, and the other fabulous parties on the party page. Make sure you check them out! « State Fair Apron Pattern Release! One of my favorite projects of yours! How cute!! You come up with the cutest ideas! So creative! I love this! The little hedgies are adorable! I’m feeling inspired to pull out my embroidery supplies again!! That is so sweet! Thank you for sharing! 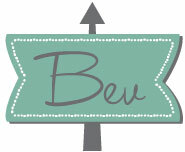 I have just stumbled onto your page and this made me fall in love with your blog and patterns. 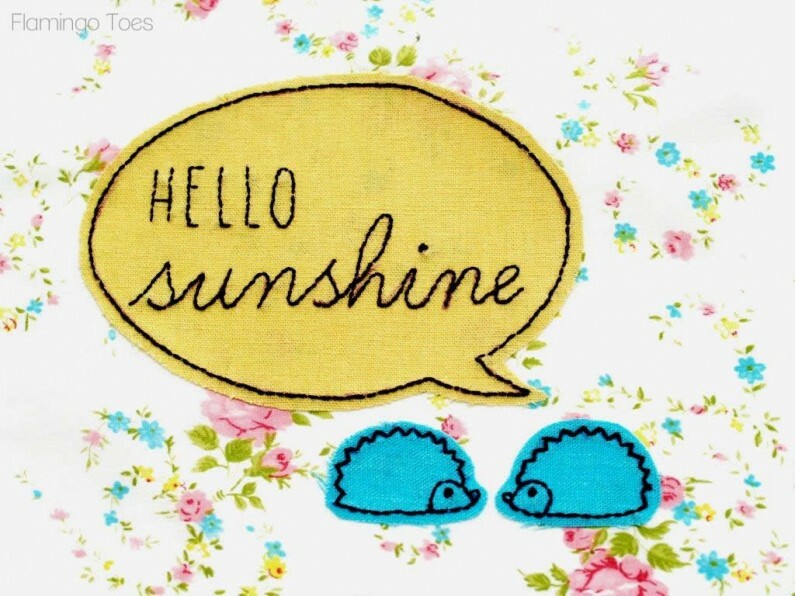 I have two pet hedgehogs and everything hedgehog wins my heart!! 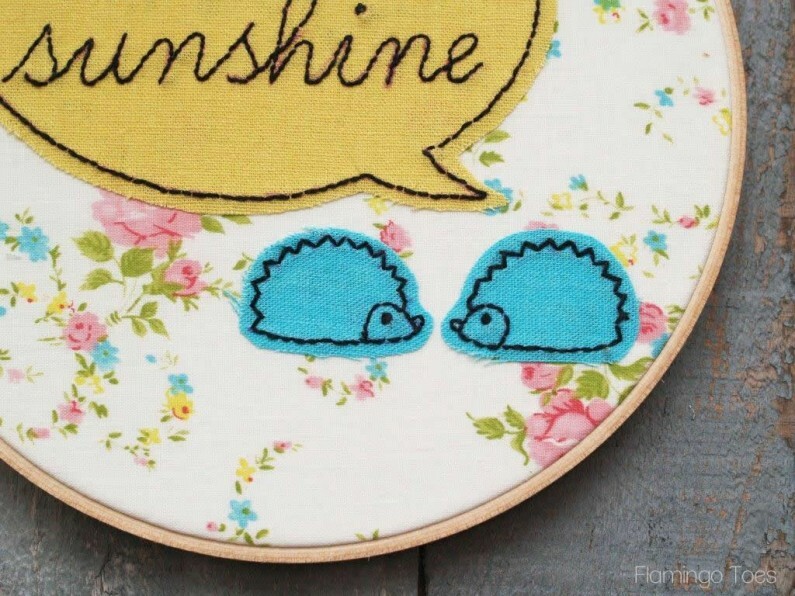 Thank you for the amazingly cute pattern and super freaking adorable hedgehogs! 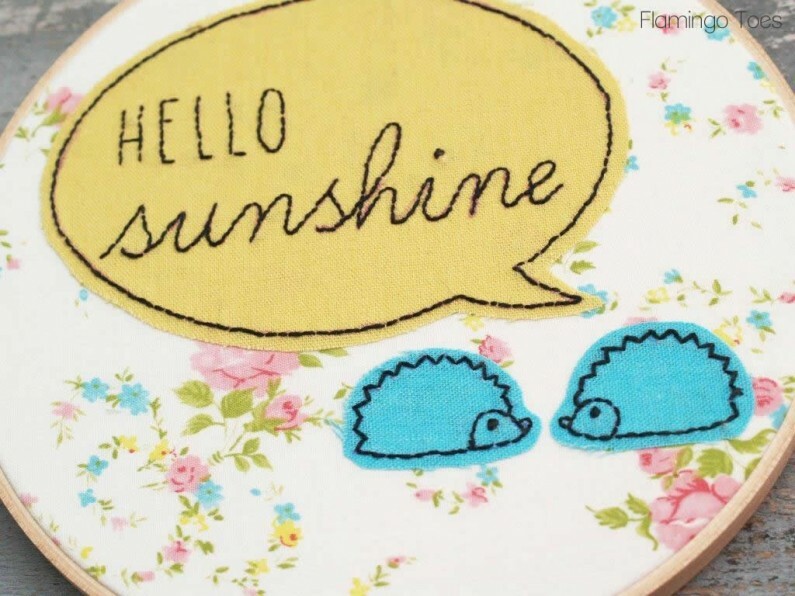 I am honestly tempted to embroider just the hedgehogs onto everything I can! I’m still pretty new to embroidery but I just love it. Thank you for sharing so many great ideas/patterns/tutorials!